Papers, Please is a weird game. The story of how this post came to exist is maybe even weirder. Papers, Please originally came onto my radar about a year ago when a demo of the game was released. It struck me as whimsical and strangely enticing; a game I definitely wanted to buy but was not in a rush to do so. Well Steam's Summer Sale solved that problem, and I've found playing the game to be an even more interesting experience. Having only put a few hours into the game I didn't want to do a proper analysis of it yet, but then I started watching the most recent season of Nickelodeon's The Legend of Korra. A befuddling tangent to be sure. I noticed a surprising number of thematic similarities between the two and was going to write a comparison, because I thought it was very unexpected and interesting. However in trying to conceptualize that post, I couldn't figure out a way to write it without dedicating most the article to gushing about Papers, Please. So, I'm just going to do that for now instead! 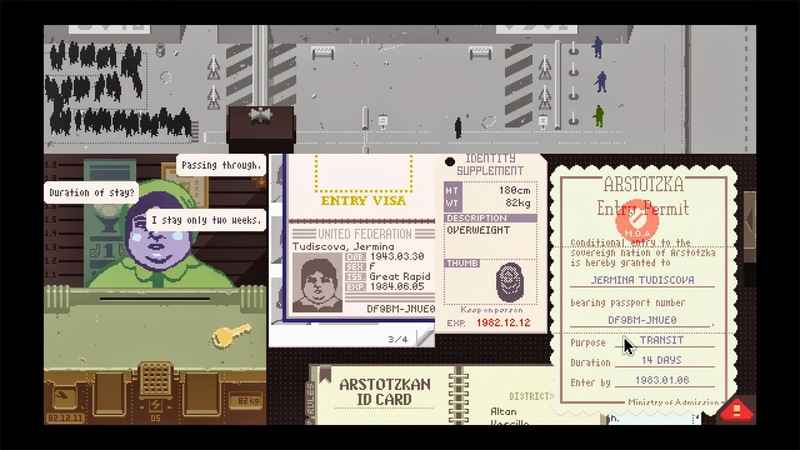 Ok, so what exactly is Papers, Please anyways? Well the concept is simple. You are an immigration officer working at the border of the fictional country of Arstotzka. Day in and day out, people hand you their papers and you must decide who can and cannot enter the country. As the days march by the political landscape gets more complicated, and so does your job. On day 1 you're just checking passports, but soon enough you're cross-checking 3-4 documents, the person's appearance and story, wanted criminal lists, etc. The difficulty in processing each immigrant increases, but your always payed $5 per person you get right. At the end of the day you go home, count your pay, and hope you have enough to pay for rent, food, heat, and whatever other expenses you may have. The next morning you wake up, read the headlines, and do it all over again. Obviously this sounds fairly boring, but it's design is surprisingly brilliant and immersive. Let me walk you through the thought process as you are playing this game. It starts off, and you are trying to get a hang for how the game works. You quickly realize that you can just barely make ends meet, and that maybe tomorrow you won't. So the next day comes, and you decide you are going to go at it hard to make sure you earn enough money. In your fervor you miss something, and your pay gets docked. You can't pay for the heat, and next thing you know little Timmy is has a cold. You quickly learn to loathe the clickity-clack sound of the tickets that pop out whenever you make a mistake. Maybe it's worth it to make sure you do your job properly. This is a game anyways right? Clearly the goal is to process everyone correctly and make enough money to provide for your family. Just put your head down, check every bit of information, and you'll surely be fine. But as the days go by, you begin to question this. You're soon checking so much information that you can't process it all quickly enough, and you start wondering if you shouldn't have more empathy. You start forgetting to check for things like fraudulent seals. Maybe you start putting less effort into checking Arstotzkan citizens, as they have fewer documents to verify and are usually legit. Maybe when a wife doesn't have the documents to enter with her husband, you're willing to give her a pass. But what happens when the next morning you read a headline about criminals entering the country? Is that your fault? Do you care as long as your pay isn't affected? What if you were bribed? What about people with cryptic requests? If some guy asks you to pass along an important document, do you trust him? How do you identify who to give it to? What if you give it to the wrong person and it increases terrorist attacks? After all, bombings shut down the checkpoint for the rest of the day, you certainly can't pay the bills working half days. These are just some of the questions you have to answer while playing Papers, Please, and this is why it's kind of brilliant. In the world that is Arstotzka's border all you do is drag some papers around and stamp the passport with the red or the green. But you have all the power, and you can do whatever you want with it. The game provides you with a framework, rewards, punishments, incentives, but never hard rules or end goals. Nobody is telling you what to do. Everyone has their own idea of what they want you to do, and they will reward/punish you accordingly, but in the end of the day the decision is always yours. You have to weigh what you value and decide how to best achieve it. Maybe you don't care about politics or emotional immigrants or cryptic cults, you just want to put your head down and provide for your family. Maybe you want to unlock all of the bonus medals, so you look for those weird situations with special circumstances. Maybe you actually don't care about your family, you just want to make sure all the terrorists get in. Who would ever suspect such a simple game to have such immersive gameplay? 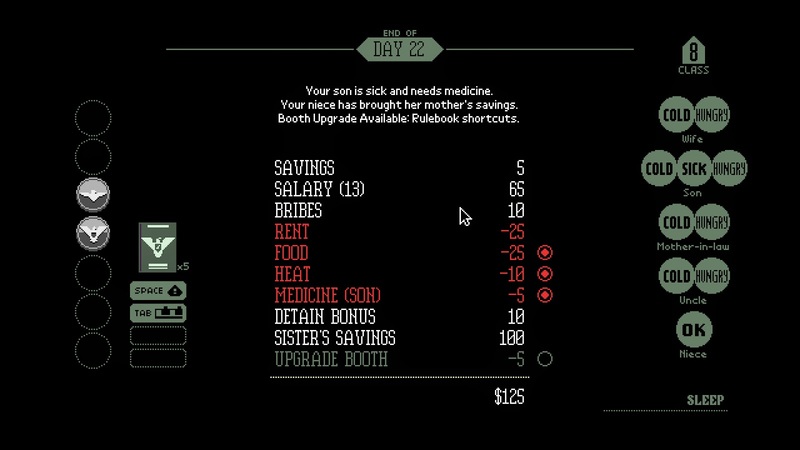 How is it that a game about doing paperwork has the best morality system I've seen in any game? You might not even realize it's there because there are no points or meters, you don't even have good vs. bad. You just have a system where your actions have real, direct, discernible consequences. You're choices aren't even that complex, you are essentially answering yes or no a couple hundred times. This is the game's key. It doesn't have deep gameplay, it doesn't have an epic backstory, it's simple. It focuses on narrative and immersion at the cost of everything else. If anything, it's simplicity just accentutes how mundane a job you are working, and how even a thoroughly monotonous existence like immigration officer is one full of meaningful choices.